When crispness enters the air in the Merrimack River Valley, and the foliage begins to don its colorful fall attire, the students of UMass Lowell know one thing is certain. River Hawk Homecoming is just around the corner and fast arriving are the Friday afternoon lines that inevitably cover the steps of the Tsongas Arena bringing in the start of Division 1 men’s hockey season. The stakes are high for the River Hawks in the 2018-19 season. The 2017-18 season saw the River Hawks struggling defensively. This struggle was made more difficult when the coaching staff was forced to switch starting goaltenders early in the year as a result of what many considered to be a sophomore slump for Tyler Wall. Difficulties on the back end were only magnified by the River Hawks’ need to find new go-to goal-scorers. The 2016-17 River Hawks saw stellar performances by Hockey East Championship MVP forward C.J. Smith and forward Joe Gambardella both of whom were considered for the most prestigious award in college hockey, the Hobey Baker Award. As a result of such spectacular performances, Gambardella and Smith were both called on to play in the National Hockey League. Defensive struggles coupled with the loss of the 2016-17 team’s leading scorers resulted in what many referred to early in the 2017-18 year as a “championship hangover.” This hangover was eventually snapped, but still brought the River Hawks to a 17-19-0 finish; UMass Lowell’s first season under .500 since the Bazin Era began seven years prior. The team still made the Hockey East Tournament but was ousted in the first round by Merrimack College. A losing season is uncharacteristic of Bazin’s River Hawks, and most negative fan sentiment can likely be chalked up to the expectations surrounding the team being incredibly high. Head Coach Norm Bazin indicated that looking at the 2017-18 season by the numbers alone can be incredibly deceiving. For the 2018-19 season to be a success, expectations from multiple consecutive winning seasons and unfair criticisms of the 2017-18 River Hawks’ mostly minor struggles must be set aside. In the 2017-18 season, the team lost key players from their previous championship run, as well as taking on six freshmen. UMass Lowell’s squad was made up largely of sophomores, and the team developed strong stat participation from all its lines. 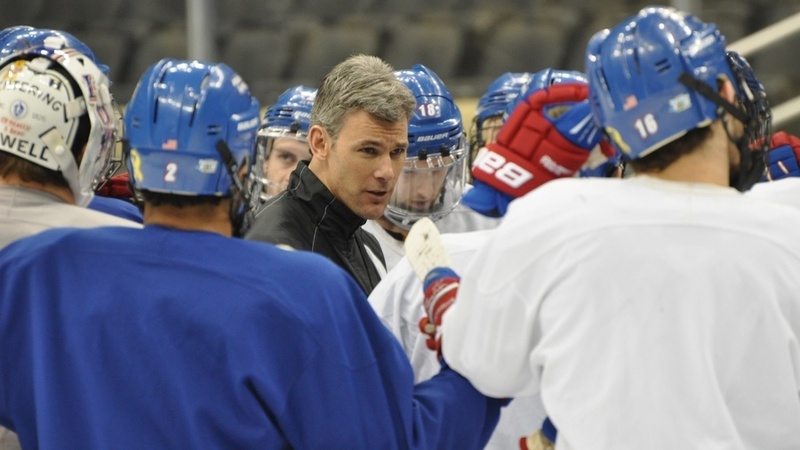 The River Hawks are currently unranked in the USCHO Pre-Season polls; however, the team appears to have a strong core. A strong goaltending core is present for the 2017-18 season in senior Christoffer Hernberg, who stepped up in a large way last season, and Tyler Wall, should he be able to move forward from his sophomore slump. The River Hawks have also retained leading scorers, Ryan Dmowski, Kenny Hausinger and Ryan Lohin, wall of whom tallied equally in the 2017-18 season. Not to mention, the team’s massive core of 12 freshman will have tried and true River Hawks Connor Wilson and Lohin to look to for leadership as the team’s captains. The River Hawks look poised and matured coming into the 2018-19 season and, should things come together, they may just shock the league with just how far they can carry themselves. Coach Bazin has a simple request for his players. UMass Lowell students can first see their River Hawk men’s hockey team take the ice at the Tsongas Arena on Sunday, October 7th in Exhibition against Acadia University, or in their Homecoming home opener weekend October 12th and 13th as they take on the Rochester Institute of Technology.